Mimosa Rocks is a stunning coastal National Park. It’s not at all well known but should be. We’re not complaining about it being relatively undiscovered: you can often walk on one of the beaches or tracks and really not see anyone else. It’s like travelling to discover this remote natural paradise yet really being so close to home. Large sections of the park were donated by environmentally conscious philanthropists because they were so taken with its beauty. Ancient Burrawang palms sit between spotted gum trees, and coastal lakes flow to the sea with crystal clear entrances of turquoise water. You can step on to the northern boundary of the park from our beach, and it stretches almost to Tathra, 25 km south. Most of our guests love visiting the park for its beaches. More intrepid guests snorkel, surf and take on the coastal walking trails. We’ve tried to put together our secrets for getting the most out of your time on your visit to Mimosa Rocks National Park. NB Like all National Park beaches, none of the beaches in Mimosa Rocks National Parks are patrolled, so of course it goes without saying, if you’re going to swim, be careful. 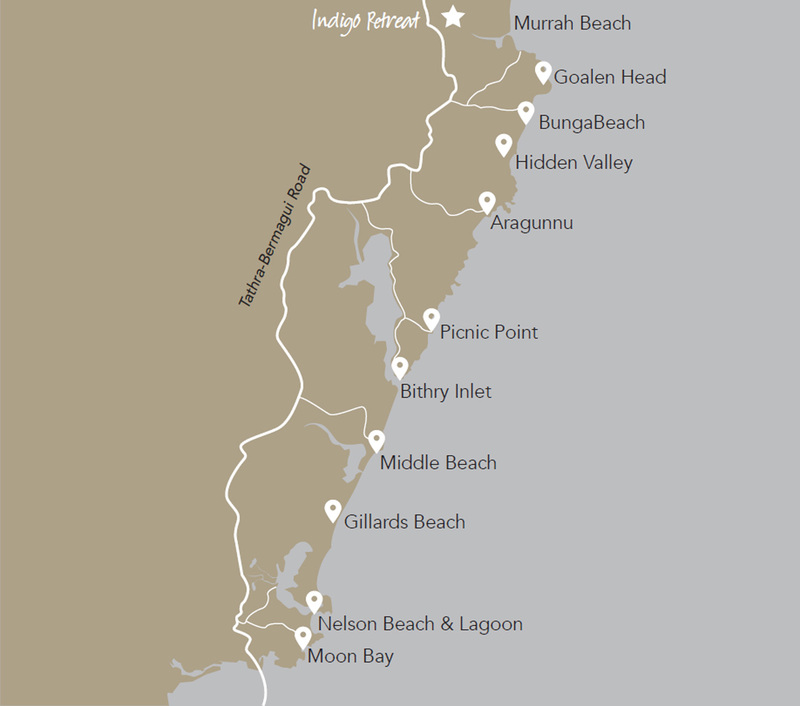 Most of the following locations are accessed from the Tathra-Bermagui Road, see our map below. Murrah Beach (our beach) is the northernmost beach touched by the park. It is 1.6km long, with two lakes Murrah Lake and Bunga Lagoon adjoining. It’s the beach we’ve been to the most and so whilst we certainly can’t promise anything, we can talk about seeing Dolphins, Seals and Whales on lucky days. If you want an experience like a Qantas Ad, be down there at dusk and you might see a Kangaroo hopping a long the beach between you and the horizon. Bunga Beach is the next one along, from there you can walk along the grass behind the beach and try and find the hidden beach at Hidden Valley (aptly named). It isn’t marked, so if it is your first time to visit, it is an adventure. Hidden Valley is a spectacular beach used mainly by National Parks Staff for camping expeditions. Find your way there for the most amazing picnic spot. Aragannu has an open sandy beach and a stunning boulder beach – build some stone towers or ‘stupas’ or just admire the works of art from other creative visitors. Picnic Point has 2 beautiful beaches, and it is an interesting drive to get there: drive along the northern shore of Wapengo Lake, looking at the oyster leases, the sunset over the lake and opening and closing rustic farm gates. Bithry Inlet on the Southern Side of Wapengo Lake is where the mouth of the lake meets the see – it has to be one of the world’s best swimming spots. Locals do laps in the lake or swim across the inlet to Paradise beach, the most perfect beach, protected from North Easterly winds and only really accessible by boat or swimming. The next beach is Middle Beach, near Middle Lagoon, then along a bit further is Gillards beach, another beautiful and wild ocean beach. Easily in our top three places to visit when at Indigo. Known as “Nelsons” to the locals, it has a short level trail around the lake that takes you to its entrance, then a beautiful walk back along its stunning beach. The last beach before Mogareeka (the mouth of the Bega River) and Tathra is Moon Bay. It is a secluded beach with an alluring name, reached by a steep 250m walking track from the car park. Hidden Valley if you are intrepid and if you are a really out-there hiker you might even get as far as Aragannu. Aboriginal middens that are well signposted. lookout giving beautiful views of the coast and whales in season. All of the lakes provide wonderful opportunities for kayaking if you are able to bring your own kayak, and of course fishing. Several of the beaches have great surf breaks. Visit the National Park’s website for Mimosa Rocks National Park if you want more specific info on surfing beaches, or track down a local and bend their ear.